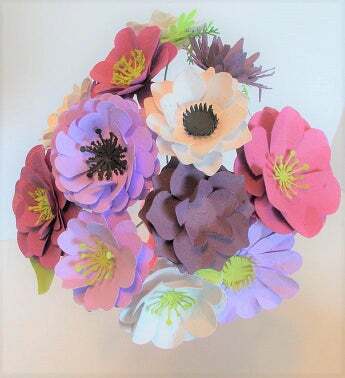 12 assorted paper flowers made from paper embedded with flower seeds that measure between 1 3/4" and 3 1/2" in size on wired stems. The seeds contained in the paper include: Catchfly, Clarkia, Snapdragon, Black-eyed Susan, English Daisy, Bird's Eye, and Sweet Alyssum. Each bouquet will be made with flowers in shades of lavender, berry, plum and white and will arrive wrapped in kraft paper. A bouquet of 12 paper flowers made from paper embedded with wildflower seeds.